‘Tis the season. Or so they say. I wouldn’t know, really, since I have been nestled in trying to get over a small cold. Nothing too bad, but with the extreme winter weather we’ve been having in South Texas the last few weeks, it’s definitely been enough to keep me undercover. I’ve still got the sniffles, but managing and now David decided to get it. Without much of an appetite, we’ve both been just grazing. I made a wonderful pot of Manhattan clam chowder over the weekend and, gratefully, that sustained us for quite a few meals. Then I whipped up a market dinner using spaghetti squash topped with sausage and peppers (from Well Seasoned Cuisine) on Tuesday night and we gobbled that up in two meals. Now that all of the leftovers have been consumed, it’s time for me to get back in the kitchen and get to work. But my culinary creativity and my palate is limited right now, so I suggested a baked potato, veg and salad for dinner. As the family carnivore, David said he wanted to add a steak or some sort of protein to the meal and so I suggested sauteed mushrooms and onions to dress up a mostly boring meal. 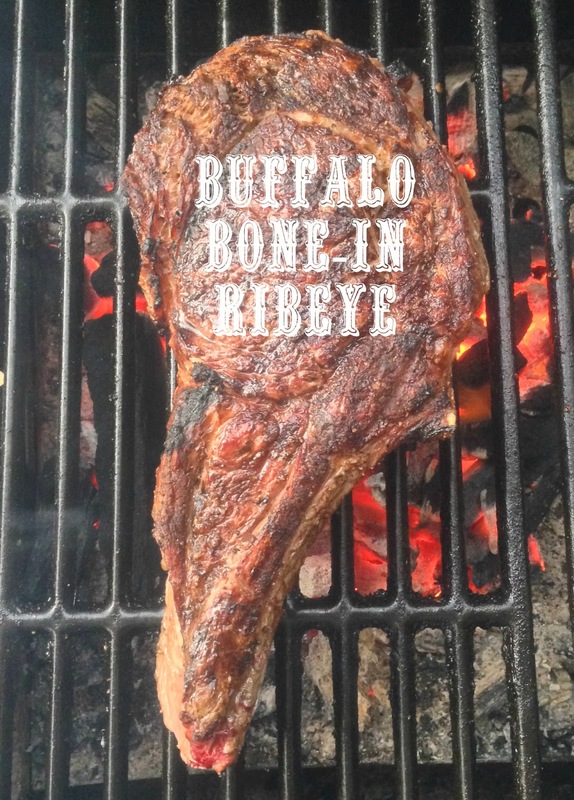 When David went to Whole Foods, the buffalo bone-in ribeye they have been promising him finally arrived and he brought home this amazing, 2 1/2 pound piece of meat. Fortunately, it pairs perfectly with sauteed mushrooms and onions and a baked potato. Which got me thinking. Most people bake a potato by putting it in the oven and pulling it out when it’s done. The skin ends up being a bit flaccid with no texture or flavor. Others may wrap the potato in foil. Or prick it with a fork. Or rub it with olive oil. And others may (gasp) cook a potato in the microwave. This potato epiphany made me realize I should share with you a trick to make an amazingly crispy and fluffy baked potato. So, in honor of Christmas–because it is the little things in life that matter–here’s a present. From me to you. In the season of giving, joy, peace and love, Happy Everything. Because nothing soothes and comforts like a baked potato. I have a special way of baking potatoes that makes the skin crispy and the interior fluffy. The bonus? You even get to enjoy two little snacks before dinner. Just don't tell anyone else about this or the secret will be out. Wash potato well and dry thoroughly. Cut the ends off. Place a large piece of aluminum foil on the counter. Place the potato and the two ends on the foil and drizzle with a little olive oil. Using your hands, rub the potato and the ends well so they have a thin coat of oil. Place them on the foil. Now wash your hands. With clean hands, sprinkle a bit of salt all over the potato and then grind a little fresh pepper all over it as well. Place aluminum foil with potato and ends in the oven and let bake for 40 minutes to more than hour, depending on the size of the potato. When the potato is done, the skin will be brown and crispy and will have separated from the potato. Cut in half and add butter of choice, salt and pepper. Serve immediately with a perfectly grilled steak or spectacularly roasted veggies and a salad.